On our first walking day we left some of the kit in the hotel room as we were coming back to Carlisle in the evening, and brought extra water because the weather was lovely and sunny. Then we had a quick breakfast and went to find the bus station, which looked like a bit of a walk on my map but was really easy to find because everything was smaller than I thought. 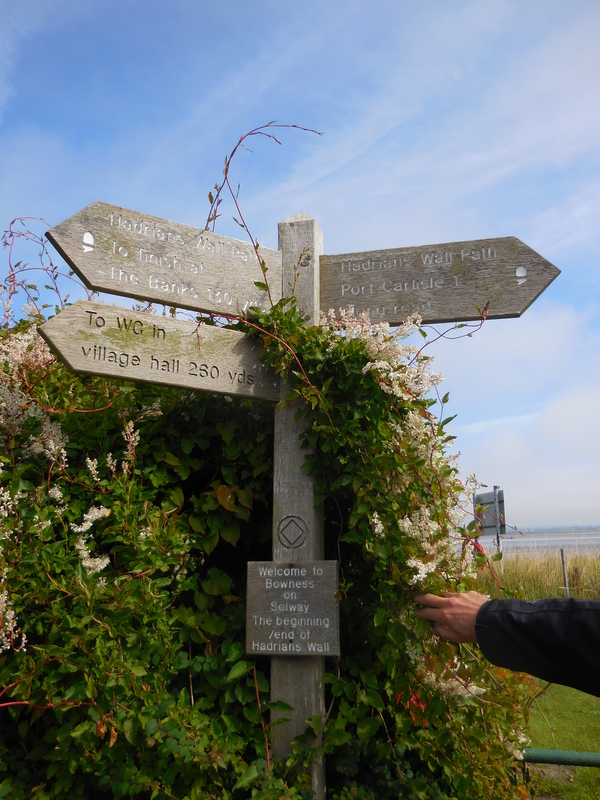 We found our bus and left at 9.35 for Bowness-on-Solway to start our adventure, along with four daytripping ladies with uncapped Leki poles and an Australian lady with a pack that seemed to be held together by gaffa tape and memories. She looked like a serious serial walker though. We saw a few other walkers en route, but not many. 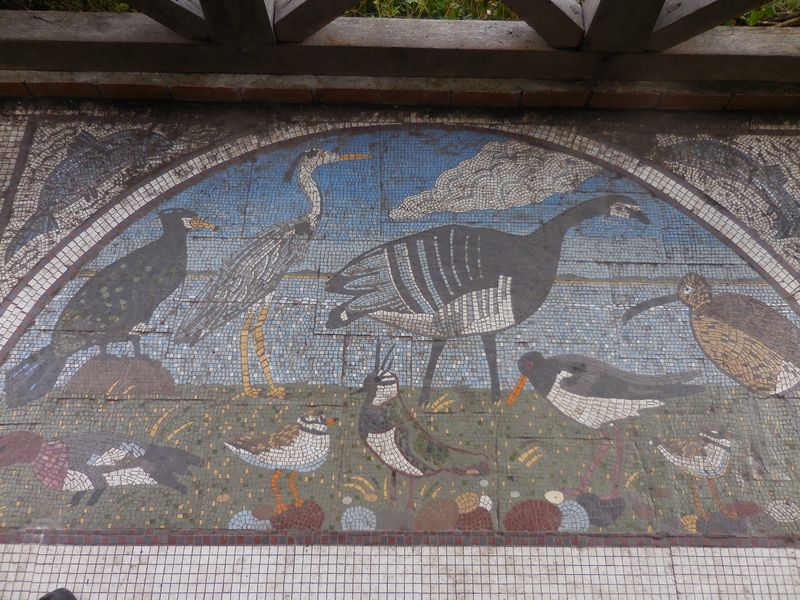 We all piled out of the bus at a corner and made our way down to the start/end point of the Path, marked by a covered bench overlooking the beach and with a lovely tiled floor. Naturally pics were taken, also we got our first stamp in our Hadrian’s Wall passport, which is a bit like a Credencial, only it doesn’t give you the right to stay anywhere, just the right to buy a special purple achievement badge if you have all seven stamps. Then there was nothing left to do but walk! In the beginning there was a bit of tarmac walking, flat, with wonderful views over the quiet and calm beach, and we were so glad we chose to start there and end up in a city rather than the other way around. The waymarking was quite good, here is the first marker we found. There was not only tarmac though, we walked on a gravel path in a wooded part, through fields and on an elevated path next to the road (we didn’t at first, thinking it was part of the wall structure, but someone told us it was the base for the old train line so then we did). Lunch was had at the Greyhound pub, which was a very welcome sight by the time we got there. Turns out we didn’t have enough water anyway and a pint went down really well with the oddest salad I have ever had – hard boiled eggs, potato salad, coleslaw, grated cheese, beetroot, tomato, cucumber, lettuce and a slice of orange(?). 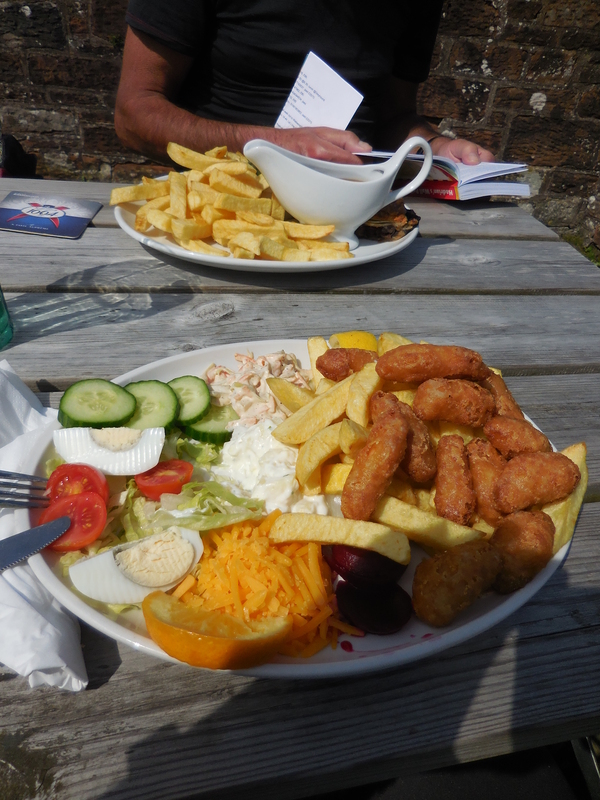 But the Whitby scampi were just perfect in the sunshine. We were aware that there would be no wall to see on the first (or second) day, as the Wall was made out of earth works and timber fortifications at this end of the country, but the landscape and small villages made up for it. 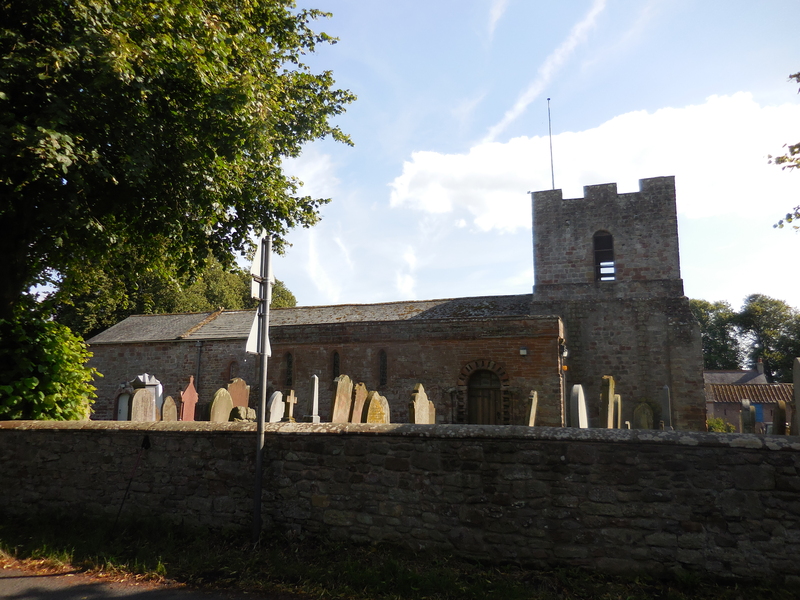 We did walk past the old St. Michael’s church with a tower that used to be a milecastle, but was lowered at a later date. The grave yard was just as amazing. The pic sadly isn’t great, we were a bit too excited to be on our way to take our time getting great photos. You can see where the higher milecastle tower used to be on the left of the building though. 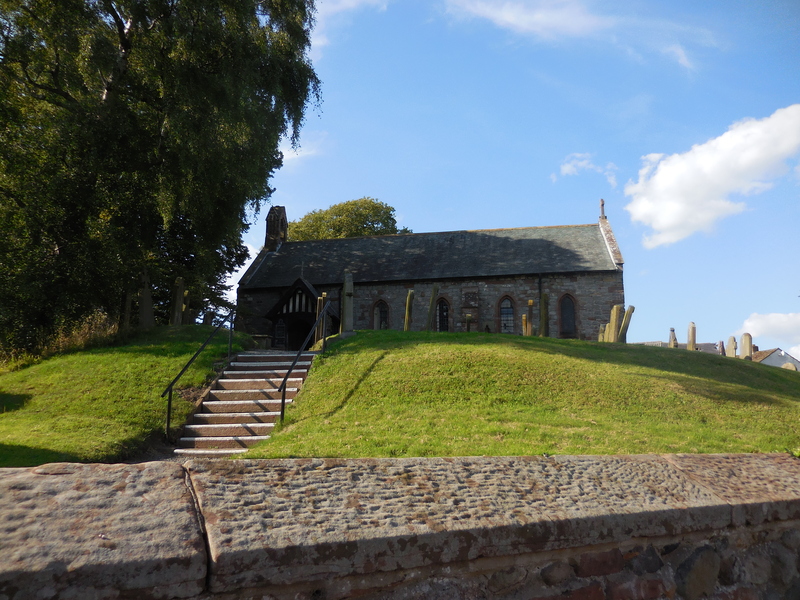 Later, in the village of Beaumont, we saw the St Mary church which is also built on the site of a milecastle. At Beaumont the Path was redirected due to the river bank being unsafe, and a sign on the village green for a Camra award winning pub led us on a ten minute detour … which was well worth it. 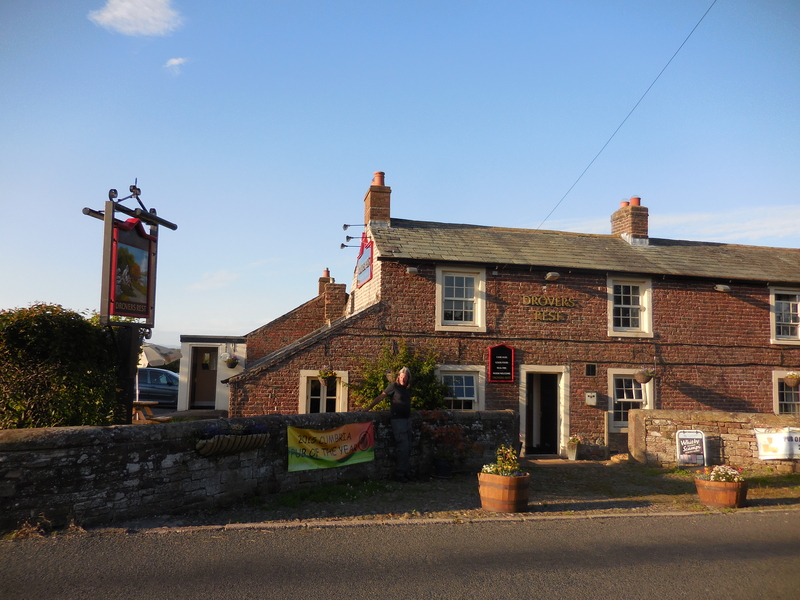 It was getting late in the day, my PF was beginning to play up, we found ourselves in the really nice Drovers Rest with outside seating and a cheese board (I do approve of a good cheese board while on walking trips) and sat down for a good rest. And when we were told that the last bus of the day would be along in half an hour to take us straight into Carlisle again, we did just that. 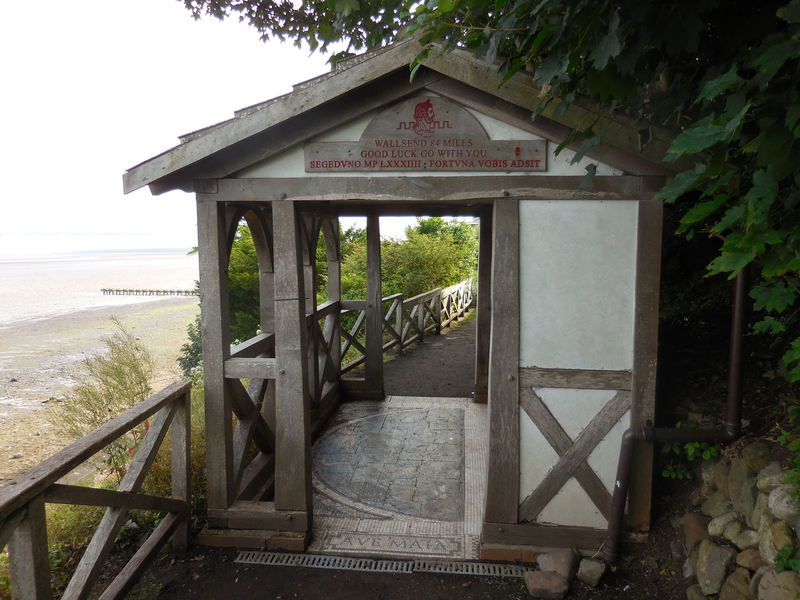 Still clocked up just under 20kms and were well pleased with our first day of walking on Hadrian’s Wall Path.